Existing users of 200 Words a Day! language learning courses can get their free language course upgrade here. (There is a form at the bottom of the page). This applies to those with 200 Words a Day! Software version 5.24 (inclusive) and before. To determine the version of your software, it's on the LOGIN page, (first page) at the bottom left hand corner. To find it, just start the software, and the LOGIN page appears. The green arrow points to where to find the version the 200 Words a Day! French, Spanish, Welsh, Italian, German language learning software you have installed on your computer. You can download the upgrade below at no cost, and it will update your version. The upgrade will not alter your previous results and statistics, that you have recorded. Your previously stored data, students' notes, test scores, learning rates and such like remain intact. Some of the additions (but not all) have been added already to more recent versions of the software. First, however read the blurb below on what the new features of the software will do. Users' feedback results in many new features being added to our language learning software courses. Several have been added in recent months. When we get a suggestion, complaint, request or recommendation we look at each one, and see if we can incorporate it into our software programming. Some are easy for our programming team to add, and others may take more time. But, be assured, if we can do it, and if it adds value to the product, we will add it. Most of these additions and improvements have come through feedback from users of our language courses. Errors you make during testing (and in kinesthetic mode - where you type as you learn) are now HIGHLIGHTED in RED, making it easier to spot your mistake. This is particularly useful when trying to find errors in sentences, expressions and longer blocks of text. It is also sometimes difficult to see a missed accent, or letter. Only the FIRST error is highlighted. If there are two or more mistakes in your typing of the answer, the subsequent errors are not highlighted. There are three amendments and additions to the SUMMARY pages. The Summary page has small pictures of all the pictures in that lesson. A customer wanted to print the Summary pages so that he could take the printouts and review them when away from his computer. A PRINT button has been added to the Summary page. One school teacher who teaches Modern Foreign Languages using our Schools' version of the software (which is networked, and can be used by hundreds of students) uses this feature to print off vocabulary that the students use in his German language classes. From the LESSON Menu (via the Professor icon on the MAIN Menu) ... clicking the right column displays the SUMMARY page of that lesson. This displays all the thumbnail pictures of all the words/pictures in that particular lesson. A customer wanted to be able to click from one Summary page to the next so we added "jump forward/back buttons" on the Summary pages (bottom right hand corner). This can help you search for a picture or word, review your learned words, or quickly preview unlearned words. In our tutorial I originally suggested that when you finished a lesson and reached the Summary page of thumbnail pictures, you covered the words and reviewed each one BEFORE attempting the Test. A user wrote and suggested we add a BUTTON to HIDE the text. So we added a "Hide Text button" (a letter 'H' icon). This gives you the option to guess the word from the thumbnail pictures before moving on to the Test. Icons on the SUMMARY page. 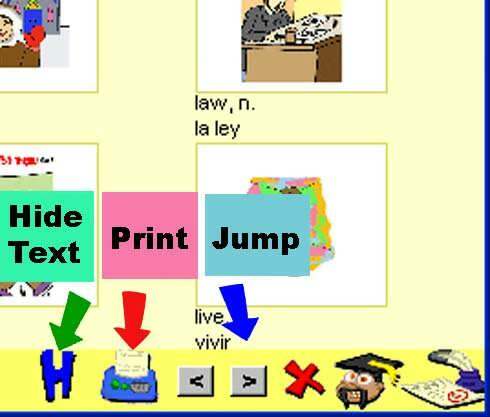 From left to right, the 'H' icon to hide text, Printer icon to print the page, 'Jump Forward/Back' to previous/next lesson Summary page. There are three new additions to the SETTINGS Menu. Some customers have expressed exasperation at losing points during testing when penalized for leaving off exclamation marks, question marks and forgetting capitals etc. They felt that the marking was too strict sometimes. To allow for those that want a less stringent marker, we've added a 'LENIENT MARKING' mode so the computer will ignore capital letters, question marks, exclamation marks during testing if you so desire! Masochists can leave the 'Lenient Marking' mode OFF and be punished for all errors. I personally prefer the discipline of our tougher marking regime! (Whip me! Flog me!). However for students learning German language with our 200 Words a Day! software, you will STILL be required to CAPITALISE the first letter of all nouns, because that is how it is in German. So, if you leave off the capitals we kick you with a deduction of one point out of a possible 3. Other languages e.g. Spanish, French, Italian and Welsh where capitals are not required for nouns, the LENIENT MARKING mode will ignore capitals. We've added a check-box to allow you to be tested on each word TWICE (in random order) during testing. This allows you to be more certain of your scoring, and allows reinforcement of the lesson. A user wrote and asked to have the option to NOT be given the correct answer immediately after making a mistake during testing. She preferred to be advised that she had made a mistake, but first wanted to see if she could guess the correct answer before being shown it. We've added a check-box to enable this option. Earlier software versions gave the correct answer immediately after student pressed 'Enter' with their response to a question during a Test. Now you can choose between the two, in the SETTINGS. The software programmes constantly assess all your scores and automatically builds and updates a lesson called 'My Worst Words'. This powerful lesson allows you to bash away at your worst-scoring words until you have head butted them into submission. The lesson can be selected at any time, and is also presented automatically in your Schedule once a week. Sometimes however a user will feel that s/he has mastered a particular 'worst word', yet it still appears in the 'My Worst Words lesson' due to its low cumulative score over several tests. In this case the user may want to remove that word from his or her 'My Worst Words' list. In this case the student can click an icon to prevent the word you are viewing, from appearing in future 'Worst Word' tests. 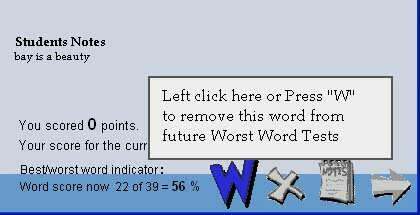 It may re-appear again in 'Worst Word' Tests if you subsequently make an error on the word in a Normal Test (e.g. Monthly or Quarterly Test) ... another customer suggestion. Previously you could only add your own Student Notes during a LESSON, and not during a TEST. However your own notes can now be added/amended during a TEST as well as during a Lesson. Student notes are your own notes that you can add to comment on a word, picture, Memory Trigger etc. They automatically create a Lesson of your own, called 'STUDENTS NOTES' which is found at the bottom of the LESSON Menu. Click on the Foreign text during a Lesson or Test to hear the word again. This will repeat the recording of the native speaker. The software programmes remind you, through an inbuilt SCHEDULER, to review your learning, at the optimum learning intervals. That is, you are automatically reminded to review what you have learned, after one day, again after a week, one month, three months and after a year. Keypressing the letter C while in the Scheduler offers you the ability to REMOVE a Test from the Schedule. On the Lesson Menu page we've added an icon (icon of the letter 'W') which enables you to select a Lesson or Test viewing only the words that are not already in your Vocabulary. (i.e words on which you have scored 3 out of 3 points). Previously Lesson 808 'Random Words Not in Vocabulary' was the only way to achieve this, but this new feature allows you to work on your 'unlearnt' words only. Please keep the feedback and suggestions coming - because we are keen to make the programme work how YOU want it. Some additions are easy, but some require quite complex programming. If we deem suggestions good, and DO-ABLE, we will add them to the software. This is only for EXISTING users of the software. You will receive an email with the LINK to get your FREE LANGUAGE LEARNING SOFTWARE UPGRADE DOWNLOAD. This only applies to you if you have already bought a 200 Words a Day! software course, and have it installed on your PC. The upgrade will 'plug into' your existing software and update it. 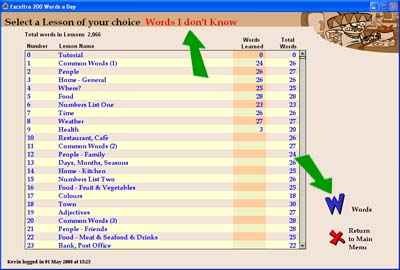 Which 200 Words a Day! language product have you purchased? *You should receive an email very soon with the LINK to the webpage. For those learning French, Spanish, German, Italian, Welsh using 200 Words a Day! courses - a free Language Course Upgrade.